Pineapple lunch tote bag with personalization. Pineapples symbolize hospitality, a warm welcome and friendship. When tropical themes are all the rage, you need this awesome pineapple-inspired lunch tote! The colors are fresh and fun in hot pink with a contrast of green and white. 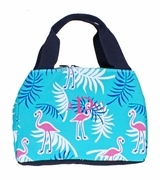 The lunch tote will hold your snacks, lunchtime meal, afternoon treat or protein boosts for gym. The main compartment is insulated and closes with a secure zipper. The bag will stand upright, ensuring that the contents remain intact. Carry it using the padded top handle. Add your personal style and embroider your initials onto the front.